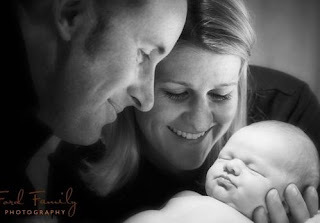 I've got a new god-daughter... what is it about newborns that is just so adorable? aw he is so adorable. I love his shades!! Congrats Auntie! Sweet baby - love it! He will only get more full of personality every day. Awesome. He is so adorable. I am going to be a first time aunt on xmas day. I cant wait. It's SO weird you commented because I was reading your blog yesterday & was going to leave a comment but my work phone rang so I completely forgot about blogging! LOL thats awesome! He is so cute Tracy! Enjoy all of your time with him....they grow up so fast! awwww! i absolutely adore the family picture with your sister and nephew. that could be an ad for perfection. i can see why you're so proud. your nephew is too cute. What a sweet sweet little guy :) Thank you for sharing the pictures! He is what life is all about - Precious and solely a Blessing!!! Congrats to them! What a blessing! p.s. thank you for the book recommendation, I'm going to check it out! I want a baby so badly! I bet you'll jump on the baby bandwagon soon! you're so lucky you get to live close by and watch him grow. even though i'm home a lot, ryan grows so fast and changes so much while i'm gone. Makes me want to have another one! Congratulations Auntie Tracy. He is a cutie! So adorable...I LOVE ths sunglasses!! I can see why you are in love with him... he's adorable!! 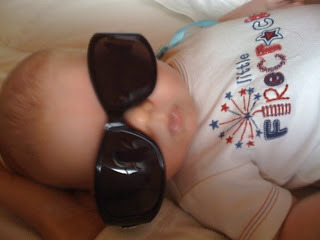 I love the big sunglasses on his tiny little self! Thank you Tracy!! A huge compliment saying that you hope to be like me as a mommy! awww...i mean...grrr....i can't see posts like this!!! they give me the worst case of baby fever!!! *he is SUCH a doll though!!! goodness! oh he is adorable! you are one lucky lady! I bet you're the best auntie! I can just tell. i keep forgetting to wish you best time ever on your vegas trip. when do you leave? it's for your bachelorette, right? oh so much fun! SO CUTE!!! I dont have baby fever ... but I definitely have the "I want to hold them and kiss their cute little cheeks all the time" fever. lol! Cutie patootie. My little sis is the same way with my dude. Aunties are priceless! Aw...he is precious! It must be fun being an aunt. So cute! your nephew is just so precious!! !